Back to basics tip #22: With the weather changing, I decided it was time to pull out warmer clothes. That was when I realized my girls needed new shoes. 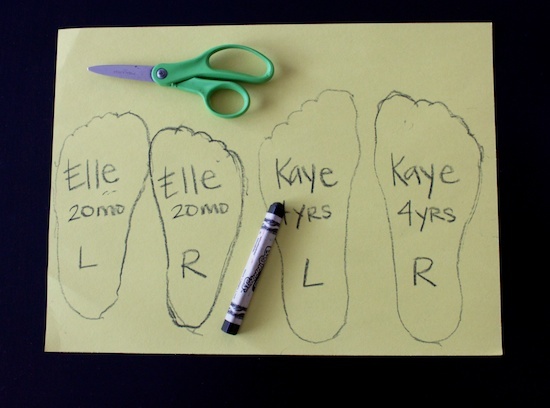 I traced the girls’ feet onto paper so I can have their shoe sizes with me at all time. Don’t you think it is tricky purchasing shoes for children? My girls are at half sizes right now. I don’t know if I shoe go for the size that fits them well now or get them a little bigger so they can grow into them. I’m not one to buy them shoes every month. 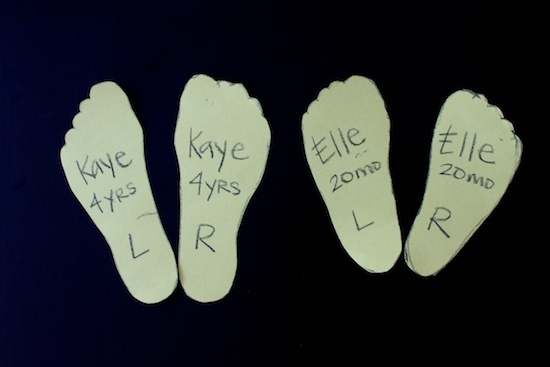 The paper feet works because I can put it in the shoe and feel for where the big toe land. It gives me an idea as to how much room is there. » Tell me… What is your tip for buying shoes for children? I usually buy my kids shoes a size bigger than they wear (at least when they were really little) My 4 year old is wearing the same tennis shoes we bought him this summer and he has worn the same dress shoes all year long. But this winter new dress shoes are in order! As for the 3 year old, she’s still growing quite rapidly, so I will he buying her’s a size bigger than she wears, so she can get the most wear out of them! Such a great idea! Even when my kids have the shoes on, it can still be hard to tell where their toes are. My boys are only one, sometimes two, sizes apart. So when it’s time for my younger son to get new shoes, I have him try on his older brothers shoes first. It gives me an idea of his shoe size before we even go to the store. That is pure genius, Tiffany! What a great idea! That’s exactly what I do! and that’s what my parents did too. I barely have time or the patience to go shoe shopping, let alone return them if they don’t fit. Genius idea! I always go up since they’ll grow. Plus, with extra snuggly socks, the little bit of room is nice.